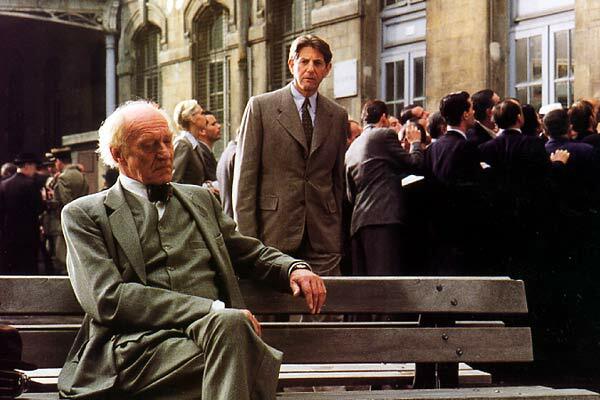 (2003 - France) The setting is 1940 Paris, where rumblings of an imminent invasion by German forces are growing louder, but few want to believe it will actually happen. Even after the Nazis invade and Paris is deserted, reality has yet to set in for the glamorous starlet Viviane (Adjani), who is more worried about the truth regarding her recently deceased lover hitting the newspapers. Frederic (Derangere), a young writer smitten with the actress, is obsessed with confronting her about the death. A high-ranking politician (Depardieu), who does recognize the severity of the situation, is pulling strings to get himself and Viviane out of the country. They - along with a mysterious journalist (Coyote), an escaped convict (Attal) and a nuclear scientist's assistant (Ledoyen) guarding a secret experiment - all unite at an overcrowded hotel in Bordeaux, and the crisscrossing plotlines begin. "Derangere and Ledoyen are perfect pure-hearted young lovers, and Attal makes a wonderful sly comic sidekick. Coyote is a fine, fox-faced heavy full of malignant envy." "A pleasing 'voyage' to French adventure... Mr. Coyote, the American actor-writer, speaks excellent French and German." A rousing, well-crafted romp packed with ingenuity, duplicity, close calls and heroic gestures... Ambitious, multi-layered tale, comfortably awash in old-fashioned gloss and theatrical archetypes, is suspenseful fun from start to finish... Attal is lawless panache personified as Raoul, and Peter Coyote shows up as a well-connected Anglo journalist who has the hots for Viviane. Crowd scenes are impressive, chases and fist fights nicely staged. Gabriel Yared's score is atmospheric but never overbearing. Production design is evocative, and both lensing and editing are aces. In fact, entire package is ultra-pro." "There's loads of plot, but what's most memorable about "Bon Voyage" is atmosphere, that and the synchronized star turns. 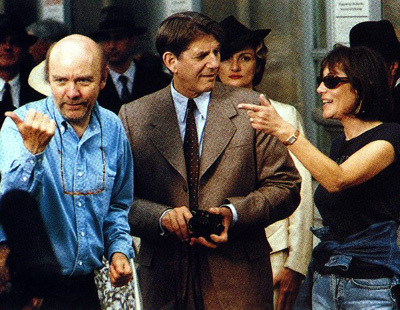 The cast includes not just impossibly youthful Isabelle Adjani and improbably slender Gerard Depardieu, but also American actor Peter Coyote, speaking credibly in both French and German." "Viviane may be a bit cloying, but the innocent Camille is bound to capture your affection as she falls for Frederic while trying to fend off Raouls advances. Even Alex, who is essentially the bad guy of the film, has some endearing qualities thanks to an eye-opening multilingual performance by the veteran Coyote." "Bon Voyage boasts an excellent ensemble cast across the board. Adjani's spoiled diva, Depardieu's cautious politician, Coyote's smooth spy, Derangère's hopeless lover, Kopolski's aged scientist, Attal's almost sympathetic criminal and Ledoyen's sweet student are all memorable characters and charmingly played." "Adjani is simply wonderful as the glamorous, radiant film star, and in mocking her character's 'helpless' behavior. Derangère is chivalrous and handsome. Depardieu has a natural charisma makes his performance seem effortless... The alluring Ledoyen gives Camille a down-to-Earth quality that contrasts with the lofty and vain Viviane. Coyote's spot-on accents in French and German makes him a convincing spy." "An utterly accessible, thoroughly entertaining World War II thriller whose mild comedic touches detract not a whit from the haunted memory of Nazi occupation. 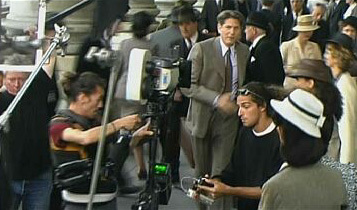 And an American actor - Peter Coyote (A Walk to Remember,Erin Brockovich) - is even on board to sweeten the deal." 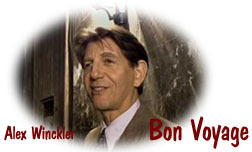 "A giddy farce with pell-mell pacing, Bon Voyage takes one of the saddest, grimmest episodes in modern French history, the fall of Paris to the Nazis, as the setting for the June 1940 flight of wealthy Parisians to the seaside town of Bordeaux, and somehow turns it into a glorious, achingly funny comedy... a slightly unsavory journalist Winckler (Peter Coyote, a long way from E.T. ), who has a too-familiar way with the German language to be trusted." "The frenetic activity in this vastly entertaining French film never lets up... 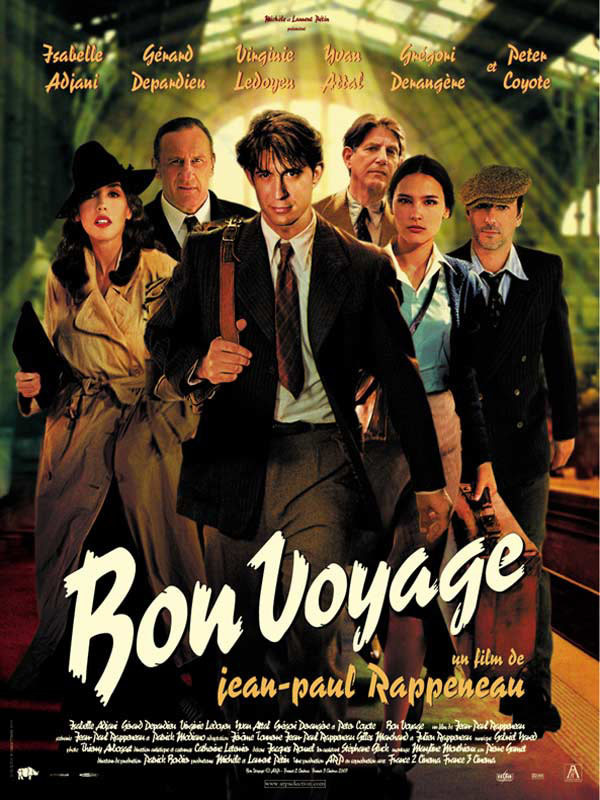 The unsavory characters in Bon Voyage, including the two-faced French cabinet minister Beaufort (Gerard Depardieu), the self-involved actress Viviane (Isabelle Adjani) and the opportunist journalist Alex (the Bay Area's own Peter Coyote, speaking flawless French) may be made up, but they surely had parallels running around France at the time." 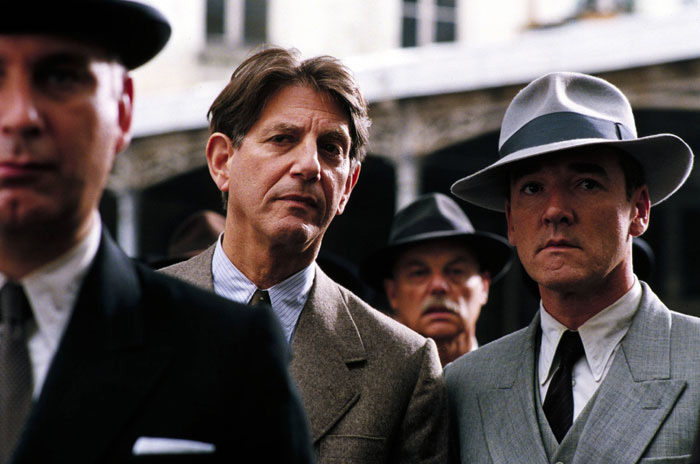 "An all-star French cast joins American Peter Coyote and audience-pleasing director Jean-Paul Rappeneau (Cyrano de Bergerac) for an amiable World War II espionage thriller whose wild mood fluctuations range from melodrama to farce." "Gerard Depardieu plays a kindly government minister intrigued by a shallow screen starlet (Isabelle Adjani) who has inadvertently framed a struggling young writer (Grégori Derangère) over a tidy little homicide or was it? Add Virginie Ledoyen as a dedicated physics student guarding a volatile discovery, and Peter Coyote playing the polyglot as a tricky turncoat, mix in along the periphery some Nazi invaders (called "Germans" throughout), and stir. The result is beautiful to behold, featuring some fine, understated performances." "Bon Voyage is doubtlessly a classy production with solid photography by Thierry Arbogast and a very able cast, including Gerard Depardieu, Virginie Ledoyen, Yvan Attal, Gregori Derangere, Jean-Marc Stehle, Aurore Clement, and in a polyglot role, Peter Coyote." "Gregory Derangere (Frederic), is the perfect young person with the class and ardour of Cary Grant. Gerard Depardieu is perfectly credible as the Minister for the Republic. It is also necessary to mention Virginie Ledoyen, Peter Coyote and Yvan Attal... Bon Voyage is a great romantic comedy of adventures. Popular and intelligent cinema..."
"Bon Voyage boasts some of Frances A-list stars (Gerard Depardieu, Isabelle Adjani), along with promising newcomers (Gregori Derange and Virginie Ledoyen, who made a splash with American audiences in The Beach) In a bit of inspired casting, Hollywood vet Peter Coyote plays a nosy journalist. And, as is typical of French cinema, beautiful scenery and equally beautiful people abound." "With its large cast, multiple plots and period sets, not to mention its commingling of genres, Bon Voyage is an ambitious, indeed audacious, film, as clever a piece of filmmaking as well likely get this year. Director Jean-Paul Rappeneau combines comedy, romance, thriller, pastiche and parody, choreographs an invasion and an exodus, stage-manages multiple infatuations and love affairs, and orchestrates a noir-ish tale of espionage. All of this, plus smart social satire and a heartfelt homage to the golden age of Hollywood... . Camille is also keeping a flirtatious eye on Winckler (Peter Coyote), a suspiciously suave English journalist who turns out to have excellent German." "Coyote brings a quiet but effective sense of menace to the inscrutable journalist Alex Winckler." 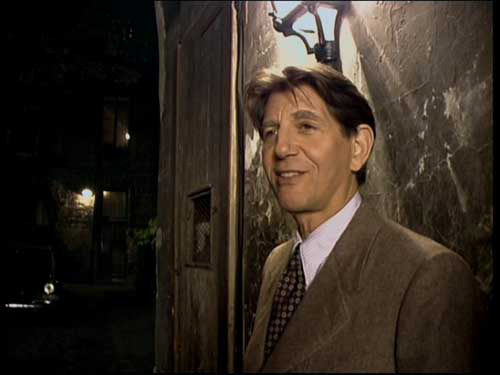 "Depardieu and Derangère are excellent, while Peter Coyote's performance is both expertly shady and compelling." "A comedy of manners with the background of war... similar to a dance where each one changes partners to each change of rhythm, richness coming from the duets which are done, demolished and remade with the thread of history, with the chance of meetings, circumstances, events... To all these characters, it is necessary to add an English spy working for the Nazis (Peter Coyote), a key character who will connect the various intrigues." "Everything in this film speaks to me. Everything has a precise relevance. Everything is connected to me, either to my family history, to my childhood, or to what shaped me over the years - my taste in books, my love of the theater, of American and French cinema, my passion for history, plus other things even more intimate. Nothing is there by chance... I have spent extraordinary months with an extraordinary cast and crew. I hope that when audiences watch Bon Voyage, they will receive all the love, the passion and the work that we've all put into it." Director Rappeneau speaks further about Coyote's role as Alex Winckler - "The character of the German spy/English journalist was Modiano's idea. Before the war there were some Germans in Paris who were very adept at speaking French and for the most they took jobs as writers and journalists. They spoke French perfectly and fit right into Parisian society, often as the lovers of actresses at the time. In our story, we portrayed a completely fictional spy, but it's all quite plausible." This was France's entry for the Academy Award's Best Foreign Language Film. However, it did not receive an Oscar nomination. In France it received 11 Cesar nominations (equivalent to an Oscar). It won for Best Cinematography, Best Production Design and Most Promising Actor (Gregori Derangere). In the US it was featured at the Palm Springs, Miami and Portland Film Festivals. Abroad it was screened at the French Film Festivals in Iceland and the Czech Republic, and at the International Film Festivals in Toronto and Copenhagen.